Tony Cascarino has attacked Jurgen Klopp’s decision to field Dejan Lovren last week against Wolves, saying it was an unnecessary risk that has now backfired. Lovren came off after six minutes to be replaced by 16-year-old Ki-Jana Hoever, with all the Reds’ other centre-backs injured, meaning Fabinho had to slot in against Brighton yesterday. Via the Daily Star, Cascarino said: “I don’t know why Jurgen Klopp played Lovren against Wolves in the cup because he’d come in for Gomez, played a number of games over that Christmas period, and was not playing before, and surprise, surprise he does his hamstring. Jordan Henderson was going to play at centre-back against Wolves but he picked up a slight knock, hence why Lovren was risked – Klopp had little choice. Joel Matip, though, was back on the bench against Brighton and is likely to be able to start next weekend against Crystal Palace, while Joe Gomez will be back at the start of February. Fabinho did a more than decent job alongside Virgil van Dijk at Brighton in the absence of any other senior recognised defenders and kept a clean sheet. 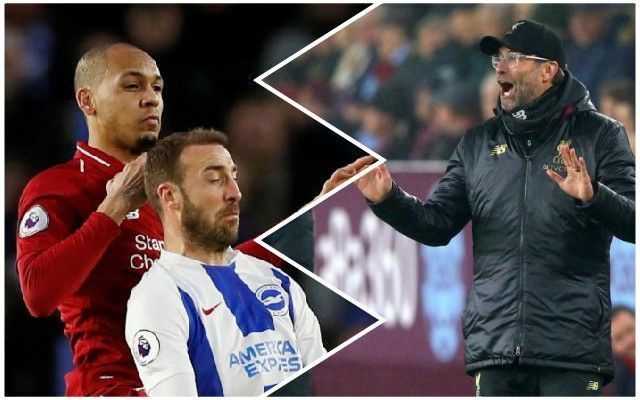 We think Klopp has just about got it right in defence this month – hence why he hasn’t ventured into the transfer market. The criticism from Cascarino certainly appears a little harsh.